It’s official: I’m the 4th and final cell phone toting member of our family to ditch AT&T and switch over to T-Mobile. In upcoming days I’ll post more about this, and include a photo of our entire family in new pink T-Mobile tshirts which just arrived in the mail today for the occasion. 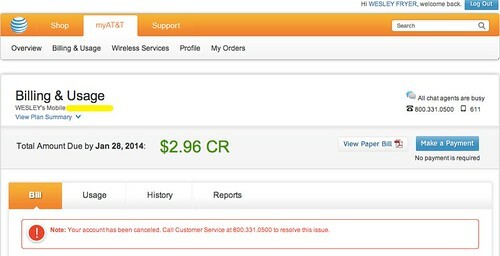 We’re going to save about $100 PER MONTH because of this switchover, and my kids now have data on their iPhones. My daughter (particularly) is beside herself with joy. I’ve got a new iPhone5s, and thanks to the T-Mobile “jump plan” I will be able to upgrade this summer when the iPhone6 is released. It’s a crazy good deal. 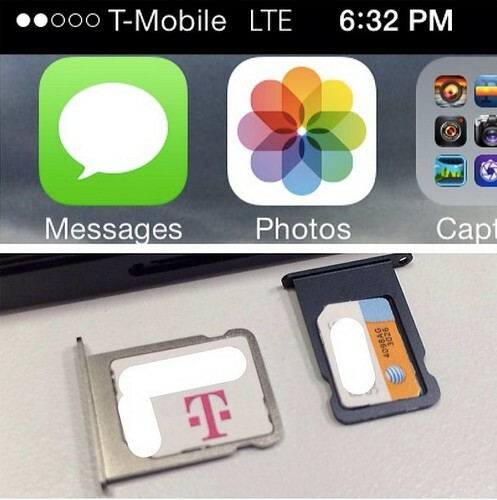 I just hope T-Mobile doesn’t get bought out by another carrier. Their monthly plans and pricing are absolutely fantastic and SO much more in line with our 2 teacher family budget. 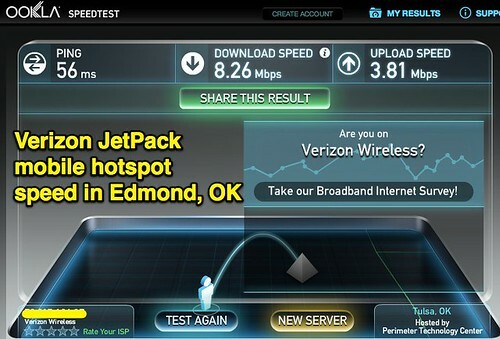 This evening I’m in an Edmond coffee shop working while my son is at Scouts, and I decided to conduct an informal “data hotspot shootout between my iPhone5s and Verizon JetPack hotspot. 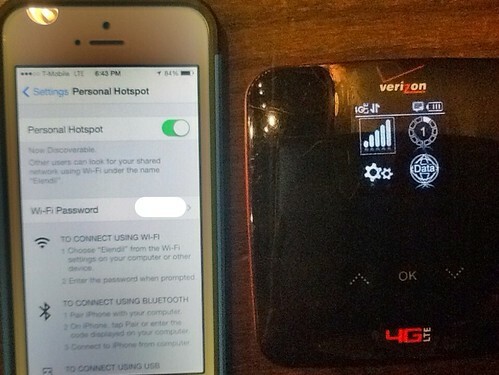 A year or so ago I signed a 2 year contract for a Verizon mobile hotspot, mainly so I could use it as I travel as a conference speaker and professional development presenter. It’s saved my hide more than once since I started using it. Back in June 2012, I wrote the post. “Considering Options for LTE 4G Mobile Hotspots & iPhone Service.” At that point, the LTE network nationwide (as well as specifically here in Oklahoma City) was much smaller. Today it’s really good in OKC. I connected my MacBook Air laptop to my iPhone5s in hotspot mode, connected to the T-Mobile LTE network, and then to my Verizon hotspot, also connected at LTE speed. Here are the results from speedtest.net: T-Mobile wins handily for both download and upload speeds! Keep in mind cell phone data connection speeds vary considerably depending on your location, so the results of this informal speed test are far from generalizable. I’m going to keep doing them in upcoming months, however, from different locations, to compare results. The biggest difference in contract terms for me at this point is that with T-Mobile, I get 2.5 GB of hotspot data per month (since I’m on their “unlimited plan”) but with Verizon, my data isn’t limited. I pay $50 per month for 5 GB, but I can go over that by paying $10 per month per GB. If I just end up using my iPhone5s personal hotspot as an emergency backup at conferences, this may prove adequate. If we need mobile data as a family on car trips to Kansas (where Verizon’s coverage is excellent since they bought AllTel in 2009) we may still want to keep it… I haven’t tried T-Mobile’s mobile data in rural Oklahoma yet… I suspect Verizon will have better coverage. 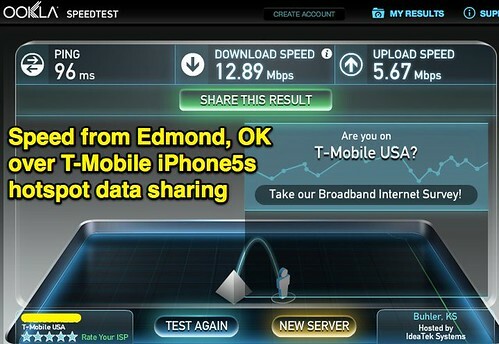 I’m quite impressed with the speed of T-Mobile’s LTE network for personal hotspot data access so far. I need to do more comparative testing to see if I can ditch my Verizon hotspot as well, and just rely on T-Mobile for hotspot data when I need it.